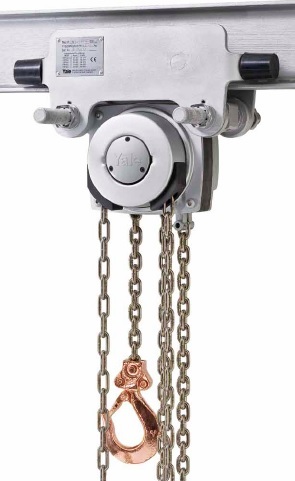 Yale Hand Chain Hoist with Explosion Proof Certified » Entagear Co., Ltd. 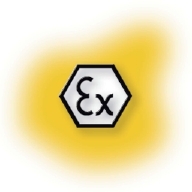 The Yalelift 360 ATEX is built for hazardous environments and is designed to meet ATEX requirements. Specifically, this unit meets EU Directives 2014/34/EU and 99/92/EC and has the classification Ex II 2 GD c IIC T4. 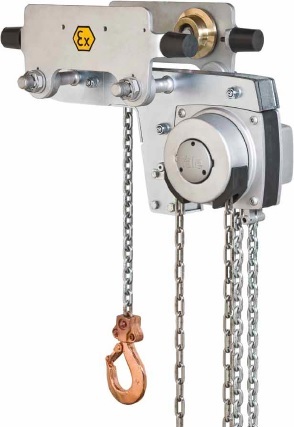 The hoist also features a spark-resistant, copper-coated suspension and load hooks; stainless steel load and hand chain; and bronze trolley wheels. 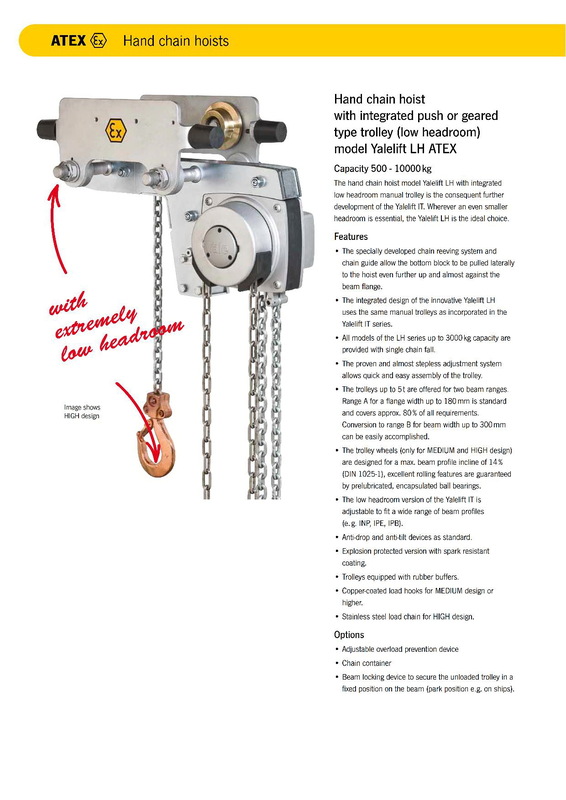 The Yalelift 360 is engineered to resist corrosion with an enclosed stamped-steel housing and a partially enclosed chain guide and gear box. MKS micro-corrosion protection system consists of an anti-corrosion basecoat layer paired with a chemical-resistant topcoat for maximum protection in harsh environments. 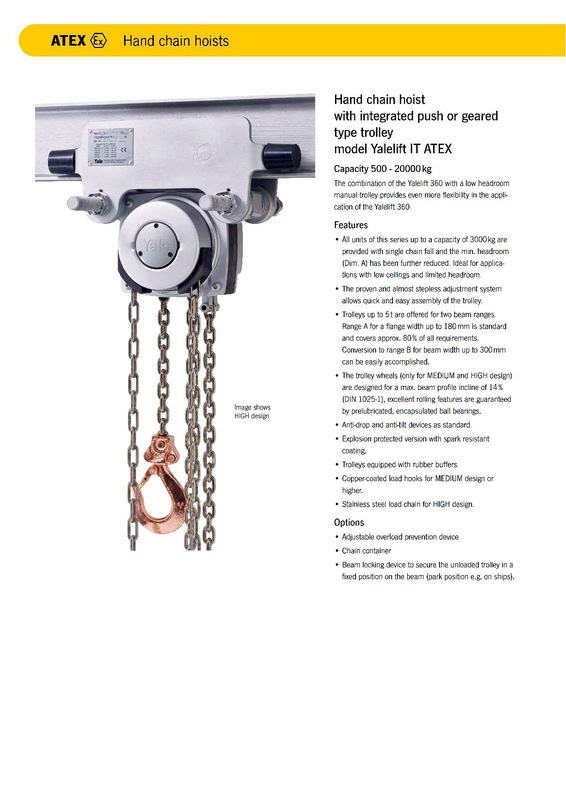 Unique in design and performance, the Yalelift 360 ATEX hoist features a patented hand chain cover that rotates a full 360 degrees to allow loads to be lifted, pulled or positioned from virtually any angle – even when the operator is positioned above the load. 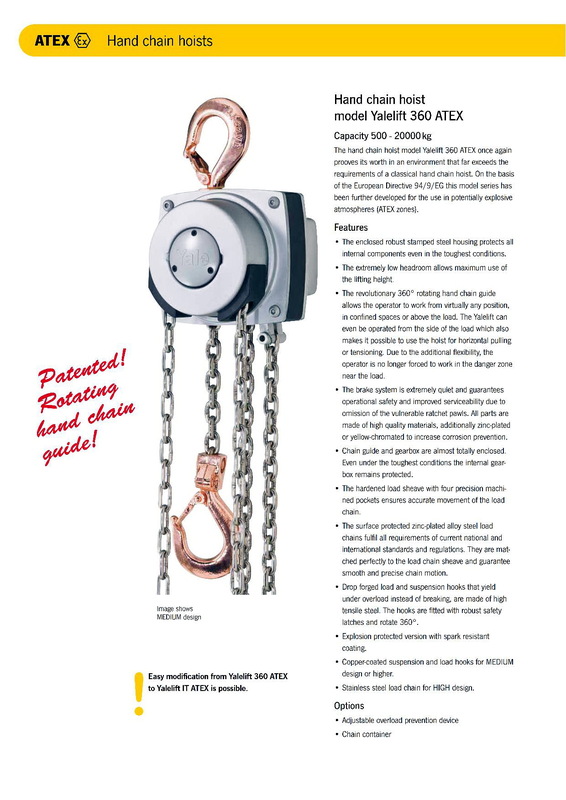 Yalelift 360 is being marketed in the Americas by CM under the name Hurricane 360.